Continuing our tour of German tram systems, we visit five more on this programme. Previously on German Trams 10 we concentrated on Berlin and three surrounding systems, this time we cover the large system at Kassel and the smaller system in Braunschweig in the former West Germany and Magdeburg, Halberstadt and Nordhausen in the former East Germany. We begin our filming in Kassel, which has a modern centre and is on the river Fulda. The trams are in a smart, predominantly blue livery and are operated by KVG (Kasseler Verkehrs-Gesellschaft AG). A number of trams carry advertising liveries. The system is of standard gauge and operates 7 routes with a large fleet of trams mostly of Duewag and Bombardier (Flexity Classic) manufacture. There is also a regional tram system, which is operated by NVV (Nordhessischer Verkehrsverbund). These are Alstom RegioCitadis trams in a mostly white livery. Our filming locations are around the city centre and at the Hauptbahnhof railway station in the city centre which has now lost its importance with the opening of a new station that is served by the ICE high-speed trains at Wilhelmshöhe. Our cameras take a ride to Wilhelmshöhe on route 1 onboard tram 657 a Bombardier Flexity Classic NGT8. After filming at the Hauptbahnhof we return to the city centre on board a similar tram, 669. With our filming completed in the city centre we move to our next destination, Braunschweig. This is a modern city that has a historic and pedestrianised centre surrounded by tramways to a 1100mm gauge. The livery is mostly white with a red trim, but many trams wear advertising liveries. They are operated by Braunschweiger Verkehrs-AG who have a varied fleet consisting of Mannheim Duewag EGT6 and GT6-NF trams, Braunschweig EGT6, Bremen NFGT6-S1100 and Magdeburg+Beiwagen NGT8D-BS with trailers. Our filming takes place in the city centre and in the historic streets around Leohardstraße. We visit the Hauptbahnhof in time to see a preserved MAN bus number 6515 (BS-HB961) leave on a special duty. Our cameras travel back to the city centre on board tram 8160, a LHB Braunschweig EGT6 to complete our filming. The third destination on this programme is Magdeburg, a modern industrial city on the river Elbe. The trams are finished in a white livery with green and red trim, with some carrying overall advertising liveries. They are operated by MVB (Magdeburger Verkehrs-betriebe GmbH) on standard gauge track. The fleet consists of ČKD Tatra T6A2+B6A2M and Alstom LHB NGT 8D trams. Our filming takes place at Ernst Reuter Allee, Alter Markt, Breiter Weg and at the Hauptbahnhof. Our two final visits on the programme is firstly to the small town of Halberstadt with a metre gauge system operated by HVG (Halberstädter Verkehrs-GmbH) in a red and white livery and finally to Nordhausen another small town with a metre gauge system operating just three routes with twelve trams consisting of 9 Siemens Combino and 3 Siemens Combino Duo. These are operated by Stadtwerke Nordhausen. Filming takes place on Rautenstraße and on Bahnhofstraße. 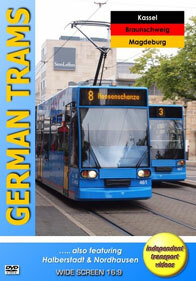 This concludes our latest programme covering the current German tram systems.